Rightways: What is Blockchain Technology, its uses and applications? What is Blockchain Technology, its uses and applications? According to Wikipedia, a blockchain, originally block chain, is a continuously growing list of records, called blocks, which are linked and secured using cryptography. Each block typically contains a cryptographic hash of the previous block, a timestamp and transaction data. By design, a blockchain is inherently resistant to modification of the data. It is "an open, distributed ledger that can record transactions between two parties efficiently and in a verifiable and permanent way". For use as a distributed ledger, a blockchain is typically managed by a peer-to-peer network collectively adhering to a protocol for validating new blocks. Once recorded, the data in any given block cannot be altered retroactively without the alteration of all subsequent blocks, which requires collusion of the network majority. Blockchains are secure by design and are an example of a distributed computing system with high Byzantine fault tolerance. Decentralized consensus has therefore been achieved with a blockchain. 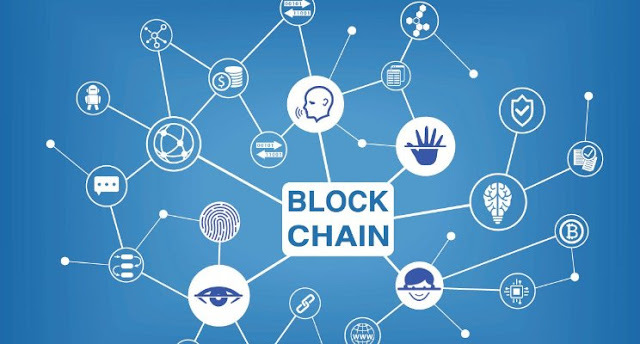 This makes blockchains potentially suitable for the recording of events, medical records, and other records management activities, such as identity management, transaction processing, documenting provenance, food traceability or voting. Blockchain was invented by Satoshi Nakamoto in 2008 for use in the cryptocurrency bitcoin, as its public transaction ledger. Blockchain technology can be integrated into multiple areas. The primary use of blockchains today is as a distributed ledger for cryptocurrencies, most notably bitcoin. While a few central banks, in countries such as China, United States, Sweden, Singapore, South Africa and England are studying issuance of a Central Bank Issued Cryptocurrency (CICC), none have done so thus far. Each of the Big Four accounting firms is testing blockchain technologies in various formats. Ernst & Young has provided cryptocurrency wallets to all (Swiss) employees, has installed a bitcoin ATM in their office in Switzerland, and accepts bitcoin as payment for all its consulting services. Marcel Stalder, CEO of Ernst & Young Switzerland, stated, "We don't only want to talk about digitalization, but also actively drive this process together with our employees and our clients. It is important to us that everybody gets on board and prepares themselves for the revolution set to take place in the business world through blockchains, [to] smart contracts and digital currencies." PwC, Deloitte, and KPMG have taken a different path from Ernst & Young and are all testing private blockchains. 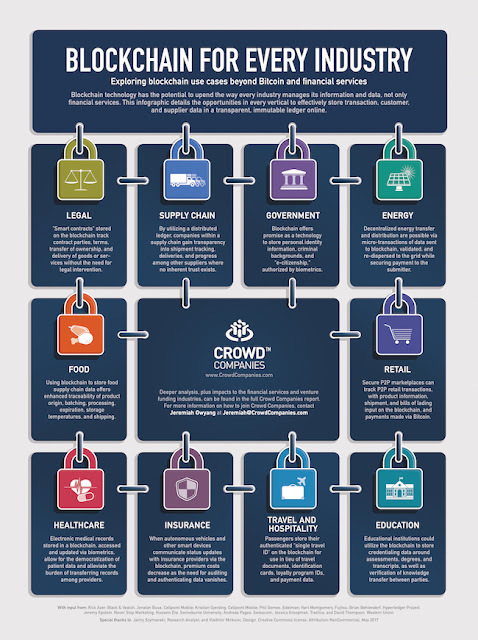 If you are in business or government or interact with businesses or government (that should be all of you), blockchain technologies will impact you in a profound way. People much smarter than me who have studied blockchain deeply say this is like the internet before Marc Andreessen co-invented the browser. Then, we had no idea that the world would change as radically as it has. The world will change radically again, and no one can predict how. However, let’s take a glimpse into the future at what people are working on now, so you get just an inkling of what’s possible. IBM is putting a lot of wood behind the blockchain arrow and aggressively going after business. One example is a project with Walmart to track food shipments. Let’s use the example of mangos. Why is this important and how does the blockchain fit in? But where does the blockchain fit in? Here’s how a blockchain-enabled mango-buying transaction works better than a process without the blockchain. It turns out that people eat more food that has been labeled "organic" than is farmed. That's because there is fraud in some claims as to whether or not something is organic and those things can make their way into shipments unbeknownst to the buyer. Now, the mangos get labeled at the source, by a trusted entity that deems them organic. That information is then recorded on the blockchain, and that information cannot be changed. The "proof of organic" is now locked in and Walmart now fully trusts its mangos are organic. That makes it very difficult to fraudulently sell you mangos that are not organic. Walmart is great at removing costs from their supply chain - maybe the best in the world. Now, they can build in a delivery price guarantee into the system, without human intervention. It works like this. Using a smart contract (code that represents an agreement) Walmart can say they will pay a certain amount for mangos that show up on the shipping dock within a specific shipment window. And, they can do that without having to create paperwork representing a different price for a late shipment. The payment to the late shipper gets changed automatically, based on the code in the smart contract. If the refrigerator truck in which the mangos are being shipped has a malfunction, the mangos could go bad. The shipper might not realize there's a problem, and Walmart might not realize there's a problem, but the consumer will be very unhappy. If the transportation company has thermometers on their truck continually report the temperature of the truck during transport, then Walmart will know that the mangos are fresh when they arrive, ensuring high quality. And, this is done automatically on the blockchain due to a trusted source of information (the thermometers) communicating with the smart contract that has set the temperature parameters. Sometimes mangos need to be recalled for one reason or another. Without the blockchain, Walmart might have to remove many thousands of mangos to ensure no customer gets a bad one. With the blockchain, Walmart now knows exactly what mangos need to be taken off the shelf. This ensures the bad mangos are removed. Yes, other technologies exist today that can do something similar as it’s related to tracking mangos. However, what the blockchain does is provide a higher level of confidence that fraud did not occur at some point along the way to protect the entity that enabled bad mangos to happen in the first place. Today, a lot of intermediate transactions can exist in a transportation process. For example, transactions between the farmer and the broker; between the broker and the shipper; between the shipper and Walmart. These transactions usually require people to approve or deny some aspect of the movement of products. Through smart contracts, a lot of these approvals can be automated and sped up by removing people from the equation. This both reduces costs and speeds up the process. Of course, this is only one example of an application that can transform an industry. Many, many other applications are being built to address very different use cases. I recommend you start to become educated on what is going on so you can get ahead of the curve. By Glenn Gow is the Marketing Partner at Clear Ventures, a CEO Coach, Board Member and Advisor, and a Blockchain Strategist. Is bitcoin one humongous scam or Ponzi scheme? Before I answer that question, let’s look at the four typical characteristics of a Ponzi scheme. First of all, there must be a promoter for the scheme. It may be a single individual or a corporation. The key point here is that there is a single party promoting (and thus benefiting from) the scheme. The second characteristic is the promised return. To attract gullible investors the scheme will promise unrealistic sky-high returns. The saying “if it is too good to be true, it probably is” always applies in this scenario. The third characteristic pertains to the investment’s liquidity, which simply means how easy it is to get out once you are in. The promoter will tend to discourage investors from cashing out using and will do so using one or more of these three approaches. The stick approach is where the investor loses a portion of his investment if he withdraws early. Conversely the carrot approach entices the investor to stay in by promising even higher returns the longer he keeps the funds invested. Finally the “too-good-not-to-share” approach requires the investor to find a new investor to take over his investment. In short, he needs to look for new fools to buy him out. Yes, the Ponzi scheme’s liquidity is at the mercy of the promoter’s whim and fancy. Thus we come to the fourth characteristic. Ponzi schemes require a constant flow of new investors (read: new money) to fund the payout to early investors. Before the promoter vanishes into thin air, a small number of EARLY investors DO actually get to cash out and enjoy the ridiculous returns. This is done intentionally by the promoter to “instill” confidence in the scheme as these early investors will help to bring in new investors. Let’s apply these four characteristics to Bitcoin. The decentralised nature of bitcoin means that there is never a single party promoting bitcoin. One may argue that there are plenty of people promoting the virtues of bitcoin. However these are all unrelated parties, akin to different investment advisers promoting the virtues of gold as an investment. Yes, bitcoin has provided spectacular profits to some investors in the past year. However these profits were never promised in the first place. 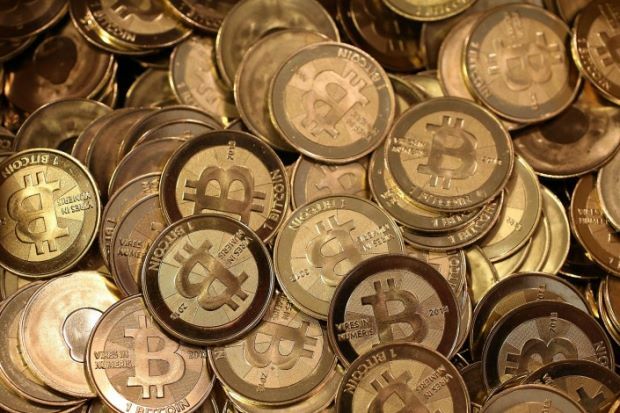 In fact people have lost money trading bitcoins, in spite its meteoric rise. This is due to the extreme volatility of the price. Does bitcoin have sufficient liquidity that is, can you get out? All the recent headlines about regulators and banks freezing the accounts of crypto-related transactions have given the impression that it is hard-to-get-out once you are in. However, nothing could be further from the truth. The decentralised nature means that there are so many alternatives for selling bitcoins, although not all are convenient. Finally, are bitcoin investors who are late to the party effectively funding the early investors’ profits? On that note, bitcoin may sound similar to a Ponzi scheme. Then again the same can be said of investors who entered the markets at the peak of the dotCom bubble or the housing bubble. This is a zero-sum game. I would be remiss if I did not acknowledge the existence of numerous proven scams out there that uses or references Bitcoin. To counter that point, note that these scams never actually put money into bitcoin, merely hitching a ride on the bitcoin bandwagon and hype. Prior to the emergence of cryptocurrencies, Ponzi schemes already existed. These schemes claim to use special techniques to generate spectacular profits from various asset classes such as commodities or real estate. Do you hear anyone labelling real estate as a Ponzi? That said, I must make the point clear that one can easily lose a fortune putting hard earned money into either bitcoins or a Ponzi scheme. Nevertheless, bitcoin is not a scam or Ponzi scheme, as outlined by the points above. Source: The Star, by Chong Jin Yoong, CFA, is a financial markets trainer and consultant. No intrinsic value: Unlike enterprises, bitcoin has no business, no intrinsic value, no cash flows and no balance sheet. — AFP I JUST. Bitcoin creator mystery, who is the Face Behind the Bitcoin?